This package includes the DVD of April’s 3-Day Workshop and a step-by-step workbook. Students can choose to take the workbook test and submit 5 case studies (one at a time) and upon approval they will receive the Level 1 Certificate of Completion. 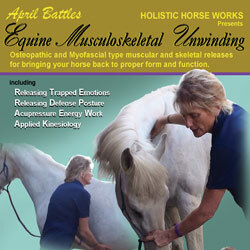 April specializes in helping your horse feel his best while offering you the most in your equine/human partnership. She also spends time with the horse owner explaining the details often left out of other professional appointments. So if you are wondering why your horses front hooves are not matching also called” high/low syndrome,” flares, or contracted heels, she will explain how the body loads the hoof is how the hoof is going to grow. To correct the hooves you need to correct the body (April teaches clinics about this as well). She will answer questions about why your horse’s poll is out, which will give you a bracey or seemingly argumentative horse avoiding contact with the bit and getting heavy on the front end. Do you have a cold backed or girthy/cinchy horse, or bucking at the canter? This indicates your horse is in pain, as ribs and withers are out of balance. Cross firing at the canter hips are out and hocks/stifles are sore from compensating. Roach back or hunters bump issues are not conformation (not correctable), that is posture (correctable) from Psoas (lower back area) in spasm not allowing hips to move freely. When the horse pulls its first rib out, either pulling a front shoe with the hind or running across a field and hits a gopher hole or mud bog, this makes canter on that side uncomfortable for your horse as well as pulling withers out, dropping ribs on that side (does your saddle tilt to one side?) and stressing the Psoas area and pulling hips out of alignment. These are all compensations from the first rib being not where it should be, which constricts that side scapula from moving freely. When the first rib is out, it causes many of the horse chiropractic issues we see today. If you do not release the first rib then you will continue to have the same problems adjusted on your horse each time the equine chiropractor comes out for a visit. This is the handy companion Workbook used in the Level 1 Course that is also demonstrated by April in the “Equine Musculoskeletal Unwinding” Home Study Program DVD and Watch Instantly.